Our solid steel pipe and drape bases are built to last and accommodate any size display. From the 6 pound 8" x 14" base (for shorter displays) to the heavy duty 61 pound 24" x 24" base (for the tallest of displays), and everything in between. 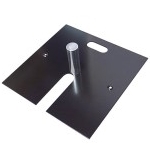 Most bases are offered in standard steel (silver) finish, or a sleek black powder coated finish. 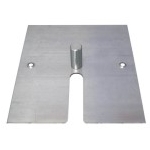 Edge protecting is available on silver bases for $3.00 per base.